Diamond Jacks Casino in Shreveport, La. The dust has barely settled on Legacy Fighting Championship’s 56th event, but the promotion is ready to offer up its 57th dose of professional MMA action, along with a side of amateur fights for good measure. The contest at the top of the bill is a title tilt for the featherweight crown. Promotional veteran Kevin Aguilar gets another crack at Legacy gold when he clashes with undefeated up-and-comer Tony Kelley. Aguilar’s only career loss came in another Legacy featherweight championship showdown. On that occasion, Aguilar, already a Legacy and Bellator veteran, squared off with UFC and WEC mainstay Leonard Garcia. Garcia squashed Aguilar’s title aspirations with a first-round TKO finish. The loss halted a run that was highlighted by a decision win over veteran Nick Gonzalez and a submission finish of the previously undefeated Hunter Tucker. Aguilar rebounded from the defeat to score a pair of victories under the Legacy banner. First, he stopped Alex Black via TKO in the third stanza. Next, he forced David Bosnick to submit as a result of strikes in the second round. Overall, the 27-year-old has seven finishes by some form of knockout and three victories via submission. He has only seen the scorecards once in his pro career, which kicked off in 2010. He had no combat sports experience prior to training in MMA. Kelley is a sneaky pick as an opponent for Aguilar. With just five pro fights under his belt, Kelley might not seem like much, but a closer look at his resume reveals that this 29-year-old is a strong prospect. He is a Team Alpha Male fighter, which means his wrestling should be a strength. “Prime Time” has only fought once or twice a year since debuting in 2013, but each of his first four fights resulted in a stoppage victory. He finally went the distance in his most recent outing, a 2015 Legacy Kickboxing undercard MMA bout against Levi Mowles. His amateur record features at least two losses, though his fight resume as an amateur varies greatly across fighter databases. Kelley was featured on MTV’s reality show Caged. Aguilar is an incredibly tough opponent for anyone. He appeared to be just a step away from the big leagues when he was served up a setback courtesy of the aforementioned Garcia. A title reign would definitely be a step in the right direction for Aguilar, but it won’t be an easy feat to achieve. Kelley has a background in jiu-jitsu and the benefit of a camp that features some of the best lighter weight wrestlers in the world. Aguilar’s best bet in this fight is to give Kelley trouble on the feet. While both fighters have demonstrated an ability to finish fights anywhere, Kelley has the edge on the mat and Aguilar gets the nod on the feet. Aguilar will give up a few inches in height, however, and might be forced to come inside to land blows on Kelley. As strong as Kelley might be, his stumbles as an amateur are cause for concern. He dropped a decision and has been stopped — several times, even, according to Sherdog’s fighter database. Aguilar isn’t going to get a cake walk in this championship tilt, but he should finally wrap a piece of gold around his waist after the final bell. 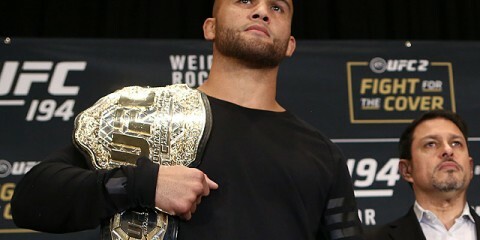 The more experienced Aguilar will put his striking to use and either score a TKO victory or wobble Kelley before finishing him with a submission. A quick glance at the top of the lineup for Road Fighting Championship’s 32nd event might cause flashbacks to the Pride era. We’re not talking about the great part of that era, either. We’re talking about the freak-show fights. However, beneath that initial layer that features a clash between Bob Sapp and Aorigele, there is at least one fight that features legitimate veterans with solid records (and a winning percentage above the .500 mark). That one fight pairs Tuerxun Jumabieke against Soo Chul Kim. American fans will be more familiar with Jumabieke. 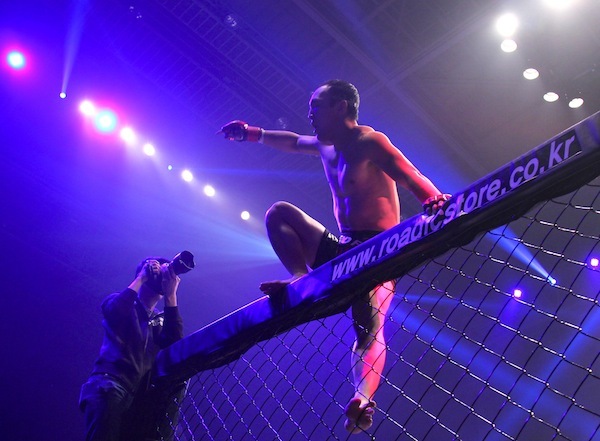 The Chinese fighter entered the UFC after a 15-0 run on the regional circuit in Asia. The results were disappointing for the heralded prospect. He dropped a decision to Mark Eddiva in his Octagon debut. His next fight ended in a submission loss to Leandro Issa. Finally, following a first-round stoppage loss to Marcus Brimage, Tuerxun was shown the door and headed back to his homeland. The Xian Sports University product fought to a draw in his first post-UFC fight, but he has reemerged with victories in his two most recent outings, including a June win over Giovanni Moljo. The 30-year-old’s grinding style has led to just four submission victories and three striking wins to accompany nine decisions. Kim hasn’t seen the inside of the Octagon yet, but he has held gold under the ONE FC banner. The South Korean fighter had a rough 4-4 start to his career after debuting in 2010, but he has gone 9-1-1 over his last 11 fights. Kim, who made his pro debut at age 18, suffered early losses to the aforementioned Issa, Andrew Leone, Gustavo Falciroli and Je Hoon Moon. He does hold victories over notable opponents such as the aforementioned Issa and Brimage, Kevin Belingon and Motonobu Tezuka. 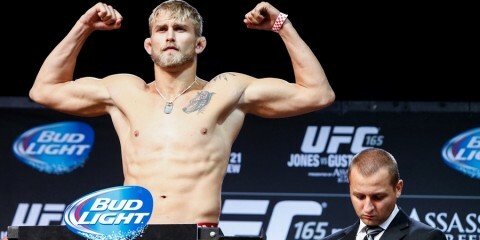 The 24-year-old Team Force fighter has notched four wins by some form of knockout and four victories via submission. There’s a lot of bad news here for Jumabieke. The trend between their common opponents is one of Jumabieke losing fights and Kim winning fights. Where the Chinese fighter was submitted by Issa and knocked out by Brimage, Kim has suffered a decision loss to Issa that he later avenged with a TKO victory and picked up a decision nod over Brimage. Furthermore, the South Korean fighter has gone the distance with top bantamweight Bibiano Fernandes and featherweight Marlon Sandro. Kim has also scored wins over UFC veterans Tezuka, Issei Tamura and Wagner Campos. Jumabieke’s can’t claim any notable victories that compare to the level of competition Kim has defeated. Kim’s biggest struggle might be in matching up to the size and strength of Jumabieke. The Chinese fighter has spent more time at featherweight than Kim, who has seen a majority of his action as a bantamweight. However, Kim’s showing against Sandro is encouraging. Jumabieke hasn’t been in the cage or ring against someone this tough outside of the UFC, and when he did face similar competition inside the Octagon, he failed three consecutive times. Kim is an underrated fighter with a well-rounded game. 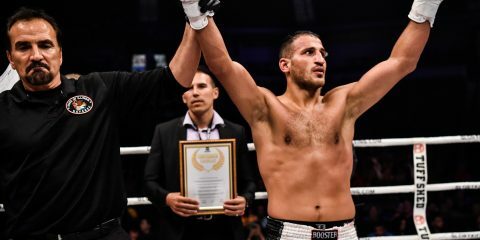 While Jumabieke will seek to out-muscle his opponent and grind out the fight on the clinch and from top position, Kim is capable of answering back and looking for the finish. The South Korean fighter might not be fortunate enough to get the stoppage, but his offensive output will give him the edge on the scorecards. The only question is whether the judges will see it his way in front of the partisan Chinese crowd that will be cheering on Jumabieke. The Legacy and Road cards in this edition of Out of Obscurity feature a single clear-cut standout fight. The same can’t be said of the latest offering, dubbed “Dynasty of Champions,” from ONE Championship. A leading Asian promotion, ONE has again brought together a lineup that has several fights worth keeping tabs on, whether it be to see how a UFC veteran will perform or to get a glimpse of some of the region’s top prospects. It’s a difficult task to pick just one fight to feature, but we’ll focus on the headlining contest between featherweights Narantungalag Jadambaa and Eric Kelly. Jadambaa is quite likely the only star name on the MMA circuit to come out of Mongolia. He is well versed in judo and Kyokushin karate. “Tungaa” is now 40 years old, and he’s been around the block. His career started in 2004 with a loss to Norifumi “Kid” Yamamoto. Following an additional loss in his sophomore outing, Jadambaa got on the winning track with an eight-fight winning streak that stretched into the Sengoku promotion, where he defeated well-known veteran Akihiro Gono and Kazunori Yokota while competing as a lightweight. He went on to win the Legend FC lightweight strap, but eventually dropped it to Koji Ando. Jadambaa’s next stop was ONE FC, where he topped Honorio Banario and Koji Oishi en route to a featherweight title reign before stumbling against Marat Gafurov. After relinquishing his belt to Gafurov, Jadambaa rebounded with a submission victory over Kotetsu Boku. When Jadambaa gets a finish, it usually comes on the mat. Kelly is one of the more well-known Filipino prospects in the Asian regional circuit. The 34-year-old made his pro debut under the URCC banner in 2009 and reeled off five straight submission wins before venturing to ONE FC. 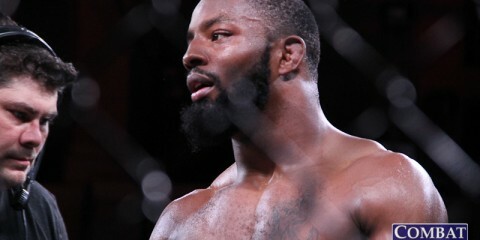 “The Natural” continued his winning ways with victories over Mitch Chilson, Bae Yong Kwon and Jens Pulver. He tacked on a URCC victory before running into a setback against the aforementioned Banario in a battle for the ONE featherweight championship. Kelley regrouped with another successful appearance with URCC and then returned to ONE to post his two biggest victories, a submission finish of Rob Lisita and a decision nod over Hiroshige Tanaka. Kelly was once again derailed when he fell victim to a submission at the hands of Ev Ting in his most recent outing. 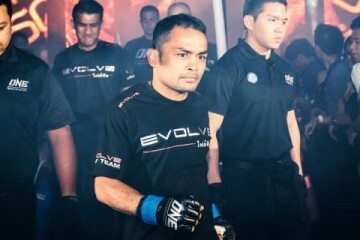 The Pinoy Top Team fighter, like his opponent, tends to get things done on the mat. This is a very intriguing contest between two aging fighter on the Asian circuit. These men are ground specialists who have defeated some strong opponents, but who have also lost against the type of talent that’s just one step shy of the big show. ONE continues to brilliantly match Kelly against tough competition. He failed his tests against Banario and Ting, but passed tests against Lisita and Tanaka. Kelly should be in line for another entertaining back-and-forth fight when he steps into the cage with Jadambaa. However, Kelly’s propensity for putting himself into bad spots could cost him against a veteran presence like Jadambaa. The Mongolian proved he’s still a formidable opponent when he tapped Boku. If Kelly lets the Mongolian achieve the advantage during scrambles, then Jadambaa will make Kelly pay. This is the grappler’s equivalent of the “first fighter to land wins” fight. If Kelly continues to make mistakes and give up positions, then Jadambaa will eat him alive. 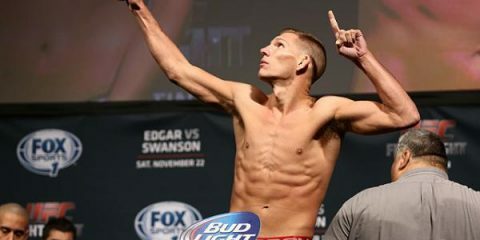 If Kelly can seize on a mistake from his opponent and then remain disciplined, then he’ll emerge with his hand raised. While it’s quite likely that Kelly gets the win, his bad habits are cause for too much doubt. Jadambaa has the experience to capitalize on Kelly’s mistakes and turn those mistakes into a submission finish.